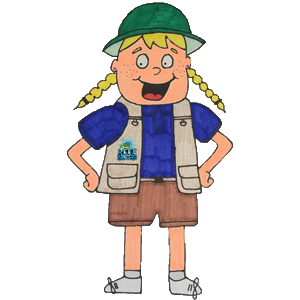 Miami Seaquarium Reef Rangers are passionate about environmental protection, science, and conservation. Visit Miami Seaquarium today to become an official Miami Seaquarium Reef Ranger and pledge to protect the Planet! To pick up at least 3 pieces of trash every time I go to the beach! To treat the environment, animals, and the ocean with respect! To try and reduce my use of single-use plastics and other unnecessary waste! To have fun learning about the ocean and spreading the word about marine conservation! 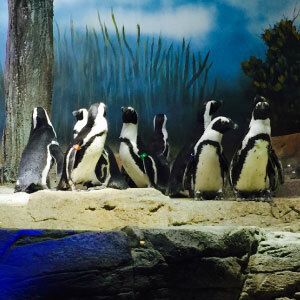 Read all about some of the endangered animals you can find at Miami Seaquarium such as sea turtles, manatees, and penguins here! As Reef Rangers it’s important to learn what you can do to help these animals. Also check out the “Rescue Rehabilitate and Release” tab to find out what Miami Seaquarium does for sea turtles and manatees! Orca whales are marine mammals! That means they breathe air, give live birth, are warm blooded, have hair, and mothers produce milk to feed to their young. Orca whales belong to the order Cetacea, which includes all whales, dolphins and porpoises. They are toothed whales and a part of the scientific family Delphinidae. Yes! That’s right, Orca whales are actually dolphins! They are the largest specie in the Delphinidae family. Orca whales earned their common name “Killer whale” by sailors who witnessed these whales attacking larger marine mammals. Where Can You Find Killer Whales? Killer whales are found in oceans all over the world! They are one of the most recognized and widely distributed marine mammal. Scientific studies have revealed many different populations of killer whales worldwide. They are most abundant in colder waters, including Antarctica, the North Atlantic, and Pacific Oceans, but have also been seen in warm water areas such as Florida, Hawaii, Australia, and the Gulf of Mexico. Killer whales are active apex predators, whose diet ranges from other marine mammals such as seals, sea lions, other toothed whales, baleen whales to sea turtles fish, and seabirds. They have been observed preying on more than 140 species of animals. Each killer whale ecotype specializes in different prey types and hunting strategies. In many parts of the world, killer whales feed mainly on either fish or marine mammals, but usually not both. What do you think a killer whale’s skin feels like? It’s smooth! This is because they have increased skin cell turnover which helps them to swim efficiently by creating a smooth body surface. Killer whales have something under their skin called blubber. Blubber is a 3-4 in. thick layer of fat. Why is blubber important to killer whales? Stores fat, which gives them energy when they cannot find food. Killer whales are black and white and have a gray patch called a “saddle” or a “cape” behind their dorsal fin. They have a white “eyespot” above and behind each eye. Killer whales are counter shaded! This means the top of their body is darker in color than the bottom of their body. When an animal is looking up at a killer whale from the ocean, the killer whale will camouflage with the light from the sun. When an animal is looking down at a killer whale from the surface, the killer whale will camouflage with the darkness of the ocean. An adult male’s dorsal fin is tall and triangular and can reach 6 feet tall! Female’s dorsal fins can curve backwards and reach 3-4 feet tall. The dorsal fin is made of dense, fibrous connective tissue, without bones or cartilage. 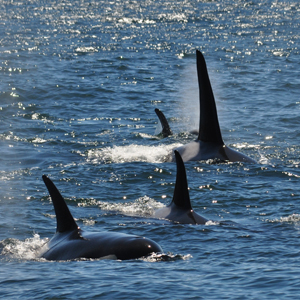 Irregular shaped dorsal fins: Some killer whales (both male and female) have irregular-shaped dorsal fins. This means they may be curved, wavy, twisted, scarred or bent. It is not fully understood why wild killer whale populations develop abnormal dorsal fins. Orca whales are considered toothed whales. They have only one set of teeth and they are not replaced if they fall out. The number of teeth varies among individuals, but there are usually 10 to 14 teeth on each side of each jaw for a total ranging from 40-56 teeth. The length of a killer whale’s tooth: is up to 4-5 in. and about 1 in. in diameter. Their teeth are not designed for chewing but for grabbing and tearing prey. Is There More Than One Type of Killer Whale? YES! Scientists currently recognize at least 10 distinct ecotypes of killer whales, based on molecular differences as well as variations in size, habitat, color pattern, dorsal fin shape, vocalizations, prey type and hunting strategies.The most well-studied killer whale populations occur in the eastern North Pacific Ocean, where 3 distinct forms, or ecotypes, of killer whales are recognized: resident, transient and offshore. 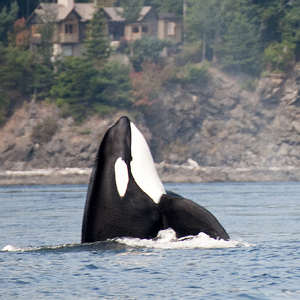 Resident killer whales in the U.S. North Pacific consist of the following populations: Southern residents, Northern residents, and Alaska residents. Where do Southern Resident Killer Whales Live? During the spring, summer and fall, Southern Resident killer whales can be found throughout the inland waterways of Washington State and the transboundary waters between the United States and Canada. During the winter months, they tend to travel and have been seen as far south as central California and as far north as Southeast Alaska. How many Southern Resident Killer Whales are there? According to NOAA’s population census in the summer of 2014, only 78 Southern Resident killer whales remain. The population of Southern Resident killer whales is composed of three family groups that have been named J, K, and L pods. Individuals are identified based on pod membership and birth order, which helps scientists identify how many whales are alive today. This information also allows scientists to track the limited number whales who are at an age where they can begin to reproduce. Are Southern Resident Killer Whales Endangered? Yes, unfortunately the Southern Resident killer whales are considered an endangered species. In 2005, they were listed under the Endangered Species Act and the population has continued to struggle due to pollution, vessel traffic and noise, and depleted food sources. In order to rebuild their populations, the Southern Resident killer whales will need to reproduce and raise healthy individuals. Currently, there are only a limited number of reproductive aged males, and the few reproductive aged females are not having many calves. 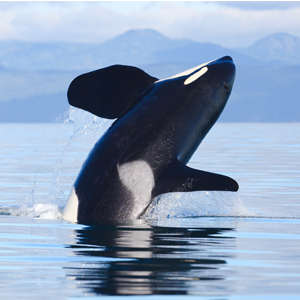 The Southern Resident killer whales tend to favor Chinook salmon as their choice of prey. Unfortunately, in the past 150 years, salmon populations from British Columbia to California have drastically declined, causing significant changes in food availability for the Southern Resident killer whales. Reductions in prey availability due to overfishing, ecosystem degradation, and hatchery production, can force whales to spend more time foraging. When it is more difficult for these animals to find food, they can become vulnerable to reproductive stresses and higher mortality rates. The Southern Resident killer whales are one of the most contaminated marine mammals in the world. Chemicals on land can pollute oceans through runoff, sewers, storm drains and coastal industrial development. Prey animals can contain these toxins and may pass them up the food chain. After ingested, these pollutants can become concentrated and reach dangerously high levels in the body tissues of marine animals, including killer whales. A mother can transfer these chemicals to her calf as it develops in her womb or when it is nursing. Whale watching tours bring the public closer to whales so they can learn about them in the wild. Recreational whale watching as a form of ecotourism has increased over the past years, which has raised concerns about how these vessels are affecting the Southern Resident killer whales. Higher exposures and proximities to boats may cause whales to alter their traditional habits, including where they move and their ability echolocate. Oil spills can have long term effects on killer whale populations. Those animals in the Alaskan waters near the 1989 Exxon Valdez oil spill experienced major declines afterwards. Spills can affect not only the whales themselves, but also their prey, which can be sickened by exposure to the oil. A larger problem is the continuous discharges of oil into the ocean, which over time exceed the volume released during major spills. Stay up to date with scientific research by reading about the recovery plans for the Southern Resident killer whale. Raise awareness about the killer whales, the threats they face and ways people can help not only protect them directly, but also protect their prey and habitat. Learn about companies that have environmentally friendly practices, so you support the organizations which help protect Orca whales and Chinook salmon. If you choose to go on a whale watching trip, make sure the company you work with is a creditable company that cares for these whales and the environment. The National Oceanic and Atmospheric Administration (NOAA) Fisheries has developed “Marine wildlife viewing guidelines” to protect marine animals, that all vessels should be following. Some of the guidelines include keeping distance and never blocking a whale from in front or behind. Chasing, harassing, touching and/or feeding marine mammals is illegal. Learn how to “Be Whale Wise” and practice safe boating, visit NOAA. It is always important to eat sustainable seafood. Sustainable seafood is either caught or farmed in ways that help protect the future of the species, the well-being of the oceans, and livelihoods of fishery dependent communities. You can choose to eat sustainably harvested salmon to help the wild populations. You can also get involved in efforts to restore and protect salmon populations. For more information on sustainable seafood, visit Seafood Watch. Take 3 for the sea! Whenever you are outside, pick up three pieces of garbage that is littering your community. If everyone did that, our environment would be a much cleaner place. Dispose of your unused medicines and chemicals properly, and NEVER dump them down the drain where they will reach water outdoors. What does a sea turtle do on its birthday? IT SHELLEBRATES. Sea turtles are reptiles, which means they breathe air through their lungs, lay eggs, have scales, and are cold-blooded. Cold-blooded, or ectothermic animals, rely on their environment to regulate their body temperature. Most sea turtles are omnivores, except adult Green sea turtles, which are herbivores. They eat a variety of different foods from sea grass to crabs to squid. Different species have different tastes, for example; Hawksbill sea turtles mostly eat sea sponges, whereas Leatherback Sea turtles usually only dine on jellyfish. How Many Kinds of Sea Turtles Are There? There are 7 species of sea turtles. Here in Florida we see 5 of those species; Loggerhead, Leatherback, Kemp’s Ridley, Green, and Hawksbill Sea Turtles. The Kemp’s Ridley sea turtle is the smallest at about 2-3 feet long and 100 pounds. The largest sea turtle is the Leatherback which can reach 6-7 feet and 1,500 pounds! Are Sea Turtles Social Animals? Sea turtles are solitary animals, spending most of their day eating and resting. Sea turtles migrate thousands of miles during their adult lives in search of food and mates. There are many theories as to how sea turtles navigate the ocean to find their way back to the beach they were hatched on. One of the most recent theories is that sea turtles use the Earth’s magnetic pull to find their way around. Sea Turtle eggs take about 60 days to develop. A sea turtle’s gender is determined by the temperature of the nest. If the nest is above 86ºF the eggs will become females and if it is below 82.4ºF they will become males. If the temperature is between 82-86 ºF the genders will be a mix of both. Baby sea turtles emerge from their nests all by themselves. They have a temporary egg-tooth called a caruncle. Located on the tip of their beak, hatchlings use it to break out of the egg shell. It might take a baby sea turtle several days to dig out of their nest. All of the hatchlings usually emerge from the nest at once. They use each other, like a totem pole, to climb to the top of the nest. Once they all break free they follow the brightest horizon to the beach (moonlight) and head out to sea. After baby sea turtles find their way to sea, they spend their whole lives traveling the ocean. They grow up and then the female sea turtles return back to the same beach they hatched from to lay their eggs. After finding their way back to their preferred beach, mother sea turtles usually climb onto shore at night to lay their eggs. They dig a pit in the sand with their flippers, lay the eggs, and then cover the eggs back up with sand to try and avoid signs that the nest is there. Sea turtle eggs are leathery so they don’t break when they fall into the nest! 2-3 eggs will drop at a time. Each nest has about 80-120 eggs! Sea turtles spend almost their entire life in the ocean. They only come to land if they have just hatched, are laying eggs, or if they are sick. Since they are always swimming, they have traits that make them very different from land turtles and help them thrive in the ocean. They have 4 flipper-like legs that help them swim. Their flippers and head are fused to their shell, so they cannot pull them inside to hide, which can make them vulnerable to predators. Their shells are streamlined to help them swim faster. Most land turtles have rounded shells that help them roll over if they are flipped upside-down. The top part of a sea turtle’s shell is called a carapace. A Sea turtle’s spine is attached to its carapace. Without its shell intact, a turtle would not survive. The bottom of the shell is called a glastron. Most sea turtle’s shells are bony, but the Leatherback’s carapace is covered by skin and oily flesh. They must come to the surface to breathe air, but depending on activity level, they can hold their breath for a long time. A relaxed sea turtle can remain under water for about 4-7 hours!! Sea Turtle mouths are shaped like beaks to help them eat animals such as crabs, sponges, and jellyfish. Sea turtles have glands called, lachrymal salt gland, under their eyes that excrete the extra salt they ingest. This is why when they come on land it can look as though they are crying. Sea turtles often get entangled in nets, long fishing lines, and trapped in fishing gear. Sometimes they are accidently caught as bycatch. When entangled, the turtles can drown and often suffer serious injuries. Trawls should have turtle excluder devices (TEDs), which have a trap door-like structure, allowing the turtles to escape but the fish to stay inside. Pollution is a huge problem for sea turtles because they are constantly ingesting or becoming entangled in marine debris. Plastic bags are commonly found ingested by Leatherback Sea Turtles, because they look like jellyfish floating in the water. If this happens, it can give the turtle a false sense of being full, get stuck in their stomach or intestines and expose the animal to dangerous toxins. Sea turtles breathe air with their lungs, so if they are entangled in trash, they might not be able to make it to the surface to breathe. Sea turtles are constantly growing. If marine debris is wrapped around them it can cause deformities or suffocation. Environmental contamination from coastal runoff, agriculture or aquaculture, construction, dredging, oil, gas, and sewage can have negative effects on the quality of water where sea turtles live. When this water pollution enters the ocean, it can make all marine life sick. Warming oceans have a potential to impact all aspects of a turtle's life cycle. From sea level rise, flooding sea turtle nests, to changing how much and where they can find food, it is unknown how badly climate change could affect sea turtles. Beach development, beach nourishment, and non-native vegetation can take away nesting areas or disrupt the natural, pre-existing beaches female sea turtles need to lay their eggs. This could create increased stress for the mother sea turtle and result in a lower survivorship of her eggs or hatchlings. In the ocean, human related activities can have negative effects on sea turtle habitats. If they are not careful, boats, anchors, snorkelers, and scuba divers may damage or destroy mangroves, sea grass beds, and coral reefs. These are areas sea turtles need to live and find food. Sea turtles must come to the surface to breathe. When swimming near the surface of the water, sea turtles are vulnerable to boat strikes. Collisions with boats can result in serious propeller injuries and death. Sometimes, when sea turtles are hit by boats, they are left with a permanent air bubble under their shells. An air bubble causes them to constantly float, as if they are wearing a life vest. Unable to swim properly, the sea turtles are then more vulnerable to predators, boats, and malnutrition. People visiting beaches can disrupt unmarked sea turtle nests. These nests can be crushed by heavy objects or vehicles on the beach. Beach toys, chairs, big holes, or sand castles on the beach left behind accidently can become obstacles for hatchlings trying to make their way to the ocean. In order to find their way to the ocean, sea turtle hatchlings follow the light of the moon and its reflection on the water. When lights on land are too bright, these hatchlings can become disoriented and go the wrong way. 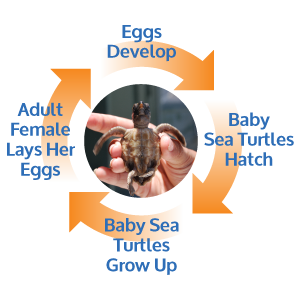 This causes the hatchlings to become more vulnerable to predators or accidents and can make them too tired or dehydrated to find the ocean. Mother sea turtles are affected by light pollution too. If lights are too bright on land, the mother sea turtle might get discouraged from nesting in that particular spot. If she can’t find a safe place to nest she will deposit her eggs in the ocean and they will not hatch. Sea turtles have many natural predators. When they are in the nest, land animals such as mammals, birds, insects, and/or crustaceans may find the eggs and eat them. When they hatch, they hurry to the ocean to avoid these land animals, but still have predators in the sea like fish and birds. When they are full grown, sharks and orca whales may still be a threat. 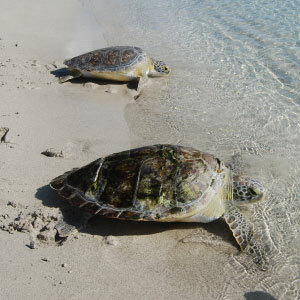 Some people also hunt sea turtles to make products such as meat or eggs, shells, leather, and oil. This is illegal in most countries, but some countries still allow it or people continue to do it illegally. As you can see, there are many human activities that affect sea turtles. 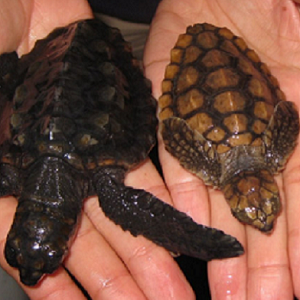 In fact, only about 1 in every 1,000 baby sea turtles survives to adulthood! Don’t worry through Rangers; all hope is not lost! There are many things you can do to help sea turtles. Learn about sea turtles and teach others about them. If more people know about sea turtles and the threats they face, more people will want to help them. Do not buy products make of sea turtle shells, skin, or meat. Never approach turtles emerging from the ocean or disturb a nesting turtle. Sea Turtles are protected by State and Federal Laws, so touching sea turtles, disturbing hatchlings, or destroying sea turtle nests is punishable by law. When visiting the beach on your own, pick up three pieces of trash that you find that are not your own. You are helping sea turtles as well as several other species of marine life. If everyone that visited the beach did this, imagine how clean our beaches would be! If you are staying on the beach for an extended period of time during nesting season, please remove all items from the beach including beach chairs and umbrellas. Items left on the beach make sea turtle’s movements on the beach difficult. Destroy all sand castles and fill up holes in the sand when you are ready to leave the beach. Sand castles and holes create obstacles for sea turtle hatchlings trying to get from their nest to the ocean. Another way we can help sea turtles is to always reduce, reuse, and recycle! Here’s a nifty idea: how about instead of throwing away your egg cartons… make a sea turtle with them! Manatees are marine mammals! That means they breathe air, give live birth, are warm blooded, have hair, and mothers produce milk to feed to their young. Manatees belong to the order sirenia. Where Can You Find Manatees? Manatees can be found in rivers, estuaries, bays, canals, coastal waters, fresh water, and salt water. You can find them all over the place BUT manatees must stay in warm waters (above 68° F). If they are caught in cold water they suffer from cold stress (manatee hypothermia). What Do Manatees Eat and Drink? Manatees are herbivores, which means they only eat plants! A manatee’s favorite meal is seagrass but they eat lots of different aquatic plants as well. They drink freshwater, just like people! What Do Manatees Do All Day? Manatees spend most of their day eating. They eat 6-8 hours a day which equates to 150-375 pounds of food a day, which is about 10-15% of their body weight daily! The rest of their day is spent swimming or resting. On average, they swim 3-5 MPH, but they can swim at bursts of 20 MPH. When they are resting, they are normally submerged below the surface of the water, but manatees must come to the surface to breathe on an average of every 3-5 minutes. What Are Some Other Cool Manatee Facts? Manatees can live for several decades. They are semi-social animals meaning they do not mind living alone and they do not mind living with other manatees. Adult females give birth to a calf about once every three years. Mother manatees are involved in raising their young and can nurse them for up to two years. If separated from its mother, an orphaned manatee would have trouble surviving on its own. West Indian manatees are the biggest of the living species. They are commonly 8-12 feet long and 800-1,200 pounds. Manatees tend to be gray or brown in color, which makes it hard for boaters or jet skiers to see them. To move around in the water manatees use their tails and their two front flippers. A manatee’s tail is also called a paddle. They move their paddle up and down to push them forward through the water. Manatees use their two front flippers for steering and bringing food to their mouth. They have taste buds that allow them to detect if a plant is good to eat or not. A manatee’s whiskers are called vibrissae. They use their vibrissae to feel around for food. Manatees have good hearing above and below the water. They communicate via chirps, whistles, and squeaks! Can you guess the manatee’s closest living relative? An ELEPHANT! They can use their snouts to push food in to their mouths, the same way elephants use their trunks. They have 3 to 4 nails on each flipper. If manatees find trash items floating in their environment they may want to check it out. They can become entangled in fishing nets or lines. If these lines wrap tightly around the manatee’s limbs and bodies, it can cause circulation problems and infections. Not only can pollution injure or entangle manatees, it can also affect them in many other ways. Pollution can block sunlight from reaching sea grasses preventing them from growing and leading to reduced food sources. Manatees also drink fresh water, so if that water is contaminated they could get very sick. Red tide is an algal bloom, a large concentration of microorganisms. Usually occurring in coastal areas, red tide happens when algae accumulates rapidly in the water column, resulting in a red or brown coloration at the surface water. Red tide produces toxins that are extremely harmful to manatees. A manatee affected by red tide may seem disoriented, uncoordinated, may be twitching and having trouble breathing. Red tide affects vertebrate nervous systems and can be harmful to humans as well as other marine life. Manatees often encounter floodgates when they travel through waterways. Remote controlled gates can crush or drown an unsuspecting manatee as it closes. If stuck on the upstream side of a gate, manatees can drown from the strong water currents created. Often found just below the surface coming up to breathe or eating shallow water grasses, manatees are hard to see. Due to their dark skin color and slow moving nature, manatees are often hit by unaware drivers. Collisions with the hull and propellers of motorboats and jet skis are the leading cause of manatee injury and death in South Florida each year. 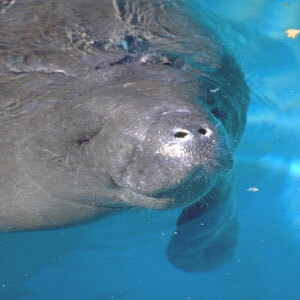 It is important for boaters to drive slow and obey speed laws in manatee habitats. South Florida has a popular climate and tropical environment. Humans must share the environment with other native species. Most of the manatee’s habitat has been altered, tampered with, or destroyed by human activities. The lack of healthy sea grass beds, mangroves, marshes, etc. have contributed to the decline in manatee populations today. Natural springs, water manatees need to drink, are threatened by increased demands for water supply and power plants. Manatees prefer warm water temperatures of about 70° F. When they cannot find warm waters, it’s harder for blood to flow to their face, flippers, and paddle. The poor circulation causes the skin to die, leaving white marks and/or open wounds behind. Cold stress can also lead to digestion problems, decreased appetite, weight loss, and a weakened immune system. Red tides and cold stress are natural threats to manatees. Flood gates, boat strikes, habitat destruction, and pollution are all threats caused by humans! As you can see there are many more human related factors causing manatee populations to decline. We need to do our part to try and prevent all of these threats from happening. 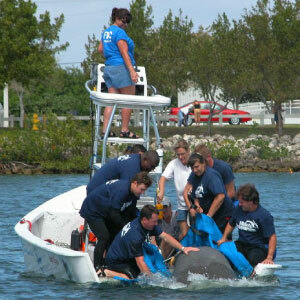 Support organizations that help injured manatees. Miami Seaquarium® is one of only three facilities in the State of Florida with a letter of authorization from the US Fish and Wildlife Service as a Manatee Critical Care Facility. Education is the key to manatee conservation. Learn about manatees and educate boaters, people that live along the coast, and beachgoers about them. Participate in a beach or waterway clean up. Manatees can become entangled in garbage, causing them serious injuries. Keep your distance and do not attempt to feed, give water to, or touch manatees. Always clean up your trash when leaving the beach. Be watchful for manatees when boating! Boat propellers can cut a manatee. Wear polarized sunglasses so you can see into the water and steer clear of manatees. Follow posted speed signs. The impact of a speeding boat can break a manatee's bones. Make sure to secure trash when you are on a boat. Penguins are aquatic flightless birds. African penguins are about 2 feet tall and weigh between 7 and 11 pounds. The y have a black upside down U-shape on their neck with black speckles on their chest. This coloration is unique and distinguishes and African penguin from other penguin species. Like a human finger print, these speckles are unique for every penguin. These spots help researchers identify penguin populations in the wild. Penguins only exist in the southern hemisphere. African penguins live and breed on the coast of South Africa and neighboring islands. They nest under boulders, bushes or even in burrows they dig out of their own excrement, called guano. African penguins eat small fish, such as pilchard, anchovies, horse mackerel and sardines. What Special Adaptation Do Penguins Have? Penguin feathers are actually modified scales made of keratin, the same thing human hair and nails are made of. Penguins have special feathers that are wind & waterproof. They naturally produce oil that they groom their feathers with to keep them dry. And under those feathers, is a thick layer of blubber, or fat that really keeps them warm in those cold waters. Usually, bird’s wings help them fly, but penguins cannot fly so their wings have adapted to be shaped like flippers that help them swim instead. They can hold their breath underwater for roughly two and a half minutes and swim in speeds up to twelve miles per hour when diving after prey. They have two other names! African penguins are also known as black-footed penguins. Another name they go by is jackass penguins because they make a sound that resembles a donkey's bray. African Penguins are monogamous, which means they mate for life. Both parents share the responsibility of taking care of their eggs. Their predators in the ocean are sharks and Cape Fur seals. Their biggest threats are the predators that eat their eggs on land such as, Kelp Gulls and Scared Ibises, mongooses, snakes, and leopards. African penguins molt their feathers for about 20 days. When this happens, they are unable to forage for food because their new feathers are not waterproof yet. Oil spills can damage their feathers, making African penguin populations and their habitats very sick. Commercial fishing technology has become more and more advanced. Ships are able to travel further and catch more fish than ever before. Since humans are taking more and more fish out of the ocean, it’s causing food shortages for wild populations. Today, food shortages caused by commercial fishing are having a negative effect on wild penguins and their ability to find food. Earth’s temperature is getting warmer every day. Climate change is causing sea level to rise. Rising seas can destroy penguin nests if the ocean water floods on nesting beaches. As the temperature of earth’s atmosphere rises, so does the ocean. Changing ocean temperatures is causing African penguin’s food source (fish) to migrate to different locations. They nest under boulders, bushes or even in burrows they dig out of their own excrement, called guano. When in African penguin habitats, people need to be careful not to remove the guano, collapse nesting burrows, or stress the penguins to the point where they are unable to breed. Humans have also been known to eat African penguin eggs, especially during the mid-20th century, when penguin eggs were eaten as a gourmet food. Another threat to penguin nests is sea level rise. Rising seas can destroy penguin nests if the ocean water floods on nesting beaches. As you can see there are numerous threats to African penguins in the wild. Most of them are human related. So, what is being done to help? Numerous efforts are underway to help save the African penguin, including strict protection of these endangered birds. Oiled birds are rehabilitated with an approximate 80% chance of success, and a limited captive breeding program is underway in Cape Town, South Africa. Furthermore, small fiberglass igloos are being placed at breeding sites and the birds using these artificial nests, which offer shelter from weather and predators. What Can Reef Rangers Do to Help? You can help reduce threats to African penguins too! Reduce your carbon footprint by riding your bike and turning off your lights. Only eat sustainable seafood that is not overfished. Use less single use plastics, toss out less trash, and recycle what you can! Miami Seaquarium® is committed to wildlife conservation and the rescue, rehabilitation and release of distressed marine mammals. This commitment began even before the park first opened its doors. In July of 1955, the park's conservation work began when Maime, a 3 week old, 47 pound manatee was rescued after being injured. Since that first rescue in 1955, Miami Seaquarium® has rescued, rehabilitated and released countless manatees, sea turtles, dolphins and whales. Since 2002, more than 80 manatees have been rescued and rehabilitated at Miami Seaquarium®. Miami Seaquarium® is one of only three facilities in the State of Florida with a letter of authorization from the US Fish and Wildlife Service as a Manatee Critical Care Facility. 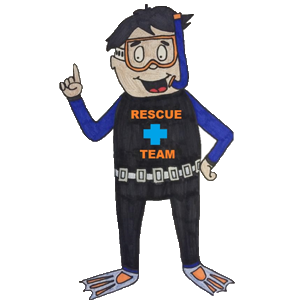 The park's highly trained animal rescue team includes divers, staff veterinarians and animal caretakers who are on call 24 hours a day, seven days a week. The first manatee to be conceived and born in the care of man. 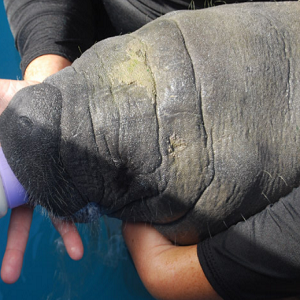 The release of the smallest manatee to have ever been rescued, rehabilitated and released. Today Miami Seaquarium® is at the forefront of manatee rescue and rehabilitation techniques and is recognized as having one of the leading marine mammal rescue and rehabilitation teams in the country.